“Come to the table,” Mom called. Dad, seven boys, and a girl, me, elbowed our way into the place set for us. The table had one end pushed against the wall with chairs on each side and Mom’s chair at the head so she could move between the kitchen and table. Our places were designated by the colour of plastic Tupperware cup set above the plate. Being the only girl, my cup was pink. Dad sat to the left of Mom, to my right, and my younger brother with his turquoise cup on my other side. If I was quick enough or volunteered to set the table, I could switch my cup with Jonathan’s, so I was not beside Dad. The table itself was oak with a steam-pressed filigree along the side and five thick, vertically splined legs. Additional sections stretched the middle to fit all of us. This piece of furniture was old, already second-hand when it came to the family before I was born. The original stain was worn by years of washing after dirty hands, bumping chairs, and dropped utensils. Some marks cut deep into the grain, testifying to the daily use of this gathering place. At Christmas, when the older girls and sometimes “stray” guests came home, more leaves were added. My younger brother and I, and sometimes a couple of the boys just older than me, were relegated to a folding card table in the kitchen while the rest of the place settings were shuffled to accommodate more people. The table was central to our family life. We ate in shifts at breakfast and on Tuesday evenings to accommodate various activities. We celebrated birthdays with a simple cake and Dad’s many verses to the Happy Birthday song. Mom worked cryptogram puzzles or read her Bible while listening to a radio preacher and many kids coloured or did homework at this central room of our home. Over the years children moved on, spreading across the country. Extra sectional leaves were removed from the table as the place settings diminished. With the nest empty, Mom and Dad decided to move closer to Granny-Gran. They sold the only house I had ever seen them in, along with much of the furniture and kitchen items. I asked about the table. It was also up for sale. I asked if I could buy it and promised we could pick it up, even though we lived 12 hours away. I sent a cheque and called my in-laws, who lived in the same town as my parents. They picked up the table to keep until we could travel down. A couple months later, seeing the table flooded my head, heart, and stomach with memories. Some were good memories, but also came painful memories of a confusing childhood. “Come to the table,” I called to my children. The table was tired, worn out, and squeaky. When the halves wouldn’t stay together anymore we packed it away, planning to one day refurbish it. Years passed. We moved several times, taking the table along and again saying that someday we would fix it. At one point we asked a hand-tool woodworking friend to see what he could do to tighten up the joints. He sanded a couple edges, replaced wooden dowels that matched the originals, and suggested it needed more work. Once again it was stored until we had time and finances. This summer my husband was cleaning the garage and decided it was time. He set the center leg on sawhorses and began to sand. Three weeks later, the detail and splines of that first leg were finished, ready for stain or paint. Taking a break from the labour-intensive legs, he attached some buckles to the underside of the table top to hold it together. He sanded the worn top surface and gouges to reveal the beautiful oak wood. Many of the dents that damaged the table were too deep to sand out completely, but they added character and memories, so he left them. The patterned steam-pressed sides posed some difficulty. 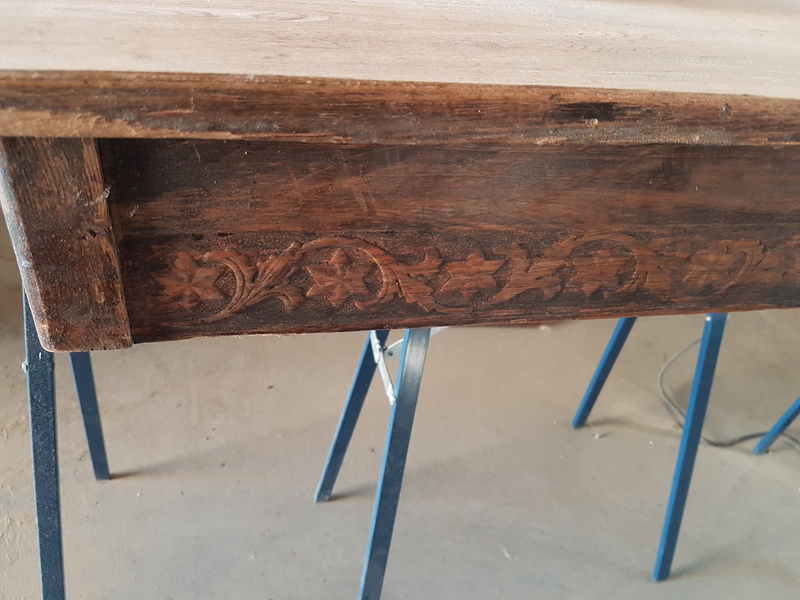 Even hand sanding the delicate pattern could damage it, but the original stain was still quite dark, and we worried the design would not be seen if we just painted over it. The other legs, too, had damage from chairs knocking against them, so while they were sanded, these splines were left with the dark stain inside, unlike the first leg. Choosing a stain slightly lighter than the original finish, Wally brushed the pigment into the wood. He covered the stain with a diamond coat lightly sanding between coats. There was little difference between the first, center leg, and the last four. The finished table had the colouring and shine I imagine the original table looked like. It was fabulous. We brought the finished table into our dining room to once again be used as a gathering place. For just us, we don’t need any leaves added, but we have them for when family, friends, or strangers visit. Why would I want the table of my childhood in my home, a reminder of pain and confusion from a difficult time of life? I believe that, like the table, I have been redeemed and made like new. Not all scars are taken away for they are too deep to completely remove. Some are needed to add to the beauty of life. Rough areas remain where struggles have knocked against me. I am worn by repeated fears and disappointments. Like this table, I am sanded down and stained with the blood of Christ to reveal a beauty despite my broken, squeaky, patina. Christ is not done placing clear coats on me, yet even now I see He is revealing His handiwork even as He continues His work in me. One day we will be called to come to His banquet table. I picture my place set there, with the table showing some of the scars of my life that God has healed but left visible to remind me of how He sands my soul. The table will be crowded so I will bump elbows with others He has invited; perhaps those who caused my deep scars as well as those who are helping them heal. Another reason I treasure this table is the purpose it has as a gathering place for family, friends, and guests. Beyond physical nourishment, meeting together around a table brings nourishment to our relationships as games are played or food and conversations are shared. It is a place to be creative, to learn, and to celebrate. Young and old, family or friend or stranger, we are included. Jesus invites us to remember Him whenever we take communion. This is also an invitation to commit to being part of His family here on earth, in our present lives, gathering at His table. There, He feeds our souls, wipes our tears, calms our fears, and lets us rub elbows to experience Godly relationships with others who also gather there as part of His Kingdom family.